A subject not dealt with, except in passing, in most books on the subject of antique silver plate is apprenticeship and freedom and the student is left to make what he or she can out of the available information. For this reason a few words about the requirement laid upon all English goldsmiths before they could have any hallmarks applied to their plate would seem appropriate. One of the earliest marks to be struck on English silver, introduced by statute in 1363 (see note 1) was the maker’s mark and to be able to use such a mark it was usual for a maker to have completed an apprenticeship in the craft of the silversmith. I think it appropriate therefore to say something about apprenticeship and what leads from it. 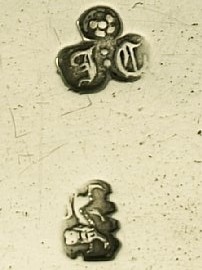 The only other marks required by law were the assay marks (hallmarks) and to have these struck on his plate the maker had to be ‘free’ of one of the Guild Companies. I start therefore with ‘freedom’ and how it was obtained. Whenever one reads anything written about specific silversmiths, either in the form of a treatise on a silversmith's life or merely the reference to him in Grimwade (see note 2) the word FREEDOM always crops up. "He was made free" or "he gained his freedom" are typical references. A student of the subject soon becomes aware that freedom must have more than one meaning and, indeed, could easily be led into the belief that there were three distinct freedoms, and a young man wishing to train and then set up shop and trade as a silversmith had to ‘gain’ all three. In fact there were two distinct freedoms which were so closely interlinked with each other that they are difficult to separate and thus lead to confusion, a confusion exacerbated by the fact that one of these freedoms is itself comprised of two freedoms which are synonymous. When an apprentice had "served his term" and his "binding" to his master was thus broken, he was free of that master. This freedom was synonymous with freedom of the Livery Company at which his apprenticeship had been registered, that is he became a Freeman of that company, but not with freedom of the City of London which had to be gained quite separately. It seems that apprenticeship was originally a rather informal affair in which a master craftsman would take on a boy to work with him, probably as a means of obtaining cheap labour. That the boy would inevitably learn the trade his master practised occurred almost incidentally, notwithstanding that this was the accepted way of passing on the trade skills from one generation to the next, and it was commonly ten years before he was declared competent to ply that trade on his own. In 1400 this term was reduced to seven years when the arrangement was formalised and a boy would be 'bound' to a master as an apprentice under a formal contract. The papers, known as indentures, relating to this contract, called 'the binding', were kept at a Livery Company Hall and at the binding the master had to pay a fee to the Livery Company of twenty shillings. Since 1531 apprenticeship has been governed by statute and under this law the amount payable by the master was reduced to 2/6 (12½p). He also had to undertake to provide the apprentice with housing, clothing and food (see note 3). The apprentice, for his part, undertook not to take on any sort of debt during his apprenticeship and not to get married. It was usual for his family to pay the Master Craftsman a fee at the binding but there was no fixed sum involved and figures ranging from less than £20 to more than £30, and even up to £80, can be found in the records. As the rules governing this contract were amended from 1835 onwards what follows is confined to conditions before that date. Although under the 1531 law governing apprenticeship the term of the binding was seven years (the term of a modern apprenticeship is four years) it could be varied; Arthur Manwaring was bound to William Tyler in 1635 and served eight years before gaining his freedom, Thomas Ash (bound in 1675) and William Lutwich (bound in 1683) also had the term of eight years written into their indentures. According to the records Jacques Desrumeaux was bound to Peter Harache II in 1703 and did not gain his freedom until 1715 but this would have been most unusual (see note 4)! Freedom from the Goldsmiths' Company could be gained by a person in one of several ways. Servitude; that is having served his time as an apprentice and satisfied his master that he had sufficiently learned his trade that his contract could be broken, Patrimony; that is gaining freedom because his father was a freeman before his birth (the applicant had to be a natural child born in legal wedlock), Redemption; that is paying a fine (fee). These freedoms could not be gained before the age of 21 years. There were also honorary freedoms, which do not concern us here, and freedom by courtesy which will be dealt with later. Freedom by servitude and freedom by patrimony were both a right and not a privilege. Freedom from the city was gained in the same way and being free of the city not only meant that a man could trade within the city limits but it conferred on him other privileges such as exemption from the military press and exemption from market fees anywhere in the country. Aliens (foreigners) had always been denied freedom and this was formalised by an act of common council of 1574 (see note 5). Freedom by servitude was achieved when the apprentice had finished his time, "learning by doing". He would present his "masterpiece", a piece made without supervision, to 'Hall' and if accepted his contract of apprenticeship was broken and he was made free of his master by 'service'. Sometimes freedom would be granted on the authority of the master without the presentation of a masterpiece. Being free of his master meant that he was, on payment of a fine (fee) of two shillings (10p), a Freeman of the Company and was qualified to ply his trade and take on apprentices of his own. He had to show however that he had learned to read and write, and to swear an oath of obedience to the wardens. It was customary for the master to provide him with two suits of clothes on being made free (see note 6) and I have come across entries in the Court of Assistant's minute books at Goldsmiths' Hall which read "Freedom and Clothing" as if the Goldsmiths' Company provided these suits of clothes but as this was not the case the entry shows how closely freedom of the Company and freedom from the master were linked. There were two levels of membership of a Livery Company such as the Goldsmiths'; Freeman and Livery. A Freeman of a livery company could apply for the freedom of the City but only when free of both the Company and the City could he become a Liveryman and although as a Freeman of the City he could stand for election as a Common Councilman, Alderman (including Lord Mayor) or Sheriff of the City, he could not become a member of his company’s Court of Assistants until he had been chosen to become a Liveryman (see note 7). The Court of Assistants is the governing body of a Livery Company and was originally an informal body useful for consultation by the Wardens but grew to be embodied in the ordinances and is now an essential part of the company. "The earliest record of Assistants seems to exist in the Grocers' annals for 1379 where it is enacted that; ‘at the first congregation of Wardens there shall be chosen six of the Company to be helping and counselling the same Wardens' " (see note 8). A man who did not gain the freedom of the City and was therefore a “non Freeman” but was free of a livery company and thus qualified to ply his trade could do so as a ‘journeyman’ provided he was licensed by the corporation. Often he would continue to work for his old master in the capacity of journeyman but he could, if he wished, go to another workshop and sometimes a silversmith would remain a journeyman for all of his working life. In order to register his mark and have his work hallmarked a silversmith had to become 'free' of one of the Livery Companies and, if not free of the Goldsmiths' Company by servitude, this could be done in one of two ways; either he could pay a ‘fine’ (a fee) and was made free by 'redemption' or he could become a freeman of the company simply because his father already was one and this was known as being made free by ‘patrimony’. He also had to swear an oath of obedience to the wardens (see note 9). Since the 16th. century a man, having served an apprenticeship in one trade, could gain freedom of a quite different Livery Company either by patrimony or by redemption (and, by extension, servitude-see Thomas Hyde below) and it was not uncommon therefore, for practising silversmiths to be free of some other company, often because it was cheaper or easier to get into it. The famous Paul Storr, for instance, was a "Citizen and Vintner of London". (For this reason the Wheelwrights' and the Spectaclemakers' Companies attracted large memberships). A man who was free of one of the Livery Companies could register a mark, take on apprentices and have his plate hallmarked, he could also apply for freedom of the City. He was then eligible to be chosen to become a Liveryman and as such could sit on the Court of Assistants and vote for and even become a 'Warden'. Freedom of the City was granted on the same terms as freedom of a Livery Company and as most silversmiths gained both, authors tend not to distinguish between them but use the word 'freedom' to cover both as if they were one and the same. This, of course, gives rise to confusion for anyone not familiar with the apprenticeship system. It appears that any freeman could register a mark and have his work hallmarked and he did not necessarily have to be a freeman of the Goldsmiths Company. Thus William Badcock, who was sufficiently well qualified as a silversmith that in 1679 he wrote 'The Touchstone' the first published treatise on the craft, had been apprenticed to "Ann Simmonds, citizen and longbowstringmaker" and in 1656 had become free of the Longbowstringmakers Company. He didn't become free of the Goldsmiths Company by redemption until 1668. In 1673, also by redemption, he became free of the Society of Cutlers of London. Thomas Hyde (see note 10) who was described between 1761 and 1784 as a goldsmith, had, in 1747, been made free of the Fishmongers Company and David Clayton II entered his first mark in July 1697 describing himself as a "free Merchant Taylor". There was one other way in which a person could register a mark and trade in the city and this was when a working silversmith died and his widow took over his workshop. She was said to be free of the City by "courtesy" provided that she had been married to the deceased silversmith for a period of not less than seven years. 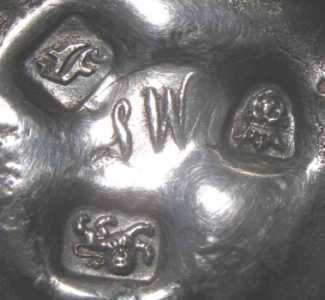 She could then continue to trade, enter a mark and have her plate hallmarked. Often a widow entered a mark (her initials) within the outline of a diamond shaped lozenge which is the heraldic ‘shield’ used for the female of the line. Although not all widows followed this practice it is, I believe, true to say that all diamond shaped makers marks of this period are those of women. She could also keep her deceased husband’s apprentices although it was usual for an apprentice to be "turned over" to another goldsmith in these circumstances. However, she could not take on new apprentices unless she had qualified workmen in her workshop. Thus when Daniel Rutty died in 1673/4 his widow took over his business and kept on his two apprentices, Samuel Webb and James Tendring, but she was disallowed from having her own son Nicholas bound to her (see note 11). Anne Hawkins, on the other hand, who by 1751 was widowed and running her deceased husband’s workshop, took Thomas Evans as an apprentice in 1757 and this suggests that her son, Richard, who had gained his freedom by patrimony in 1748, was in charge of that workshop (see note 12). Although these women had gained a "freedom" there was no suggestion that they necessarily had any training or skill in the trade so that I have found no recorded evidence that the well known Hester Bateman, who took over her husband’s business on his death and registered her first mark in 1761, ever made a piece of plate herself although it must be said that she has become famous for producing plate whereas he was only registered as a chain maker (see note 13)! There were, of course, women who were made free in their own right and were recognised as being skilled at their trade although it is true that these are few and far between. Ann Hill (Grimwade 38-39) was recorded as free of the Goldsmiths’ Company on the entry of her first mark in 1726. Although some men were made free of both a livery company and the city as soon as they had completed their apprenticeship and others remained journeymen all of their working lives it was not uncommon for a man to work as a journeyman for a period of two years before being made free of the city by redemption (see note 14). By the 18th century it had become much more common than formerly for silversmiths to specialise in the production of specific items of silverware. Thus Charles Adam and later Samuel Wood are accepted as caster makers, John Café (Case ?) and Ebenezer Coker made candlesticks, Robert Abercromby and Ebenezer Coker salvers and towards the end of the century the Chawner family were established as spoon makers. That is they made what we now call flatware. Not unnaturally apprentices to these specialists tended themselves to become similarly specialised in their work and, in some cases, on gaining their freedom, went into partnership either with their masters or with fellow apprentices. Thus it is that some of the best quality work in these specialist fields can be traced to members of these "dynasties". From the point of view of identification this can be helpful since it is not unreasonable to assume that a good quality candlestick, for example, was made by a known candlestick maker rather than by a maker, with a similar maker’s mark, who is not known for that specialism. A good example of this is the Chawner workshop which spawned William Fearn, apprenticed in1762 and his apprentice William Eley, apprenticed in 1770. Apprenticeships stayed within these dynasties and by the beginning of the 19th century there was a triple partnership of Eley, Fearn and Chawner, or the three Williams as they are known to collectors, turning out large quantities of good quality flatware. George Smith III had also been apprenticed to the Chawner workshop in 1765 and he, too, became a specialist spoon maker. Thus it was that the whole edifice of the City’s economy depended on freedom of the City and this, in turn, rested on the Livery Companies which had their foundation in the apprenticeship system. note 3: J.S. Forbes HALLMARK A History of the London Assay Office. The Goldsmiths’ Company & Unicorn Press 1999 p54. NB: The fish, which we consider a luxury today, salmon, was so plentiful in earlier times that an act was passed forbidding a master to feed salmon to his apprentice more than twice a week! note 7: Vivienne E. Aldous-My Ancestors Were Freemen Of The City Of London-Society of Genealogists-1999. pp9,10,11,17. note 10: Apprenticed to John Harvey (Goldsmith) free of The Fishmongers’ Company who, in turn, was apprenticed to Matthew Judkins (Goldsmith) also free of The Fishmongers’ Company.